Mission: Supports the 355th Fighter Wing combat missions tasked by the President, the Secretary of Defense and the Chief of the Joint Chiefs of Staff. The squadron also directs operational support functions including airfield, air traffic control, and weather services, weapons and tactics, plans and exercises, intelligence and aircrew flight equipment for 355th Operations Group, flying two A-10C squadrons. 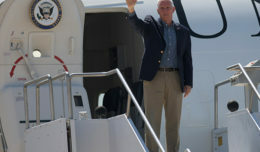 The OSS provides aviation support for for three other flying groups, totaling 10 tenant flying units, and Customs and Border Protection Air and Marine Operations operating on base. The OSS develops flying schedules for more than 14,000 sorties per year. Vision: Provides unmatched operational support to ensure seamless operations on Air Combat Command’s busiest single runway airfield. Mission: Train the world’s finest attack pilots. Description: Conducts and maintains academic, flying, specialized, and electronic interactive training for A-10C aircraft, meeting Air Force training requirements for more than 245 upgrade pilots, and A-10C conversion pilots annually. The squadron manages and assists development and approval of all aspects of Air Combat Command A-10C syllabi and operates more than $11 million of advanced fighter aircraft simulators. It also provides quality assurance for aircrew training contracts valued at more than $5.7 million. 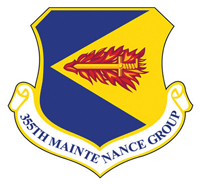 History: The 355th Tactical Training Squadron activated Oct. 1, 1975, with the 355th Tactical Fighter Wing at D-M AFB. 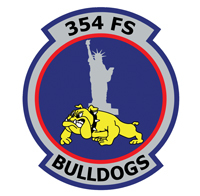 The 355th TTS remained the sole training source of A-10 pilots until May of 1992 when it deactivated and A-10 student pilot training fell under the control of the 355th OSS. 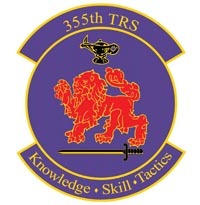 The 355th TRS reactivated in July 1996 and is responsible for the overall execution of all A-10C formal training courses. Mission: Maintains combat-ready posture for worldwide deployment of 21 A-10C aircraft to deliver attack airpower for the defense of the U.S. and its global interests. It employs precision engagement to conduct day and night close-air support, air interdiction, forward air control, and combat search and rescue. 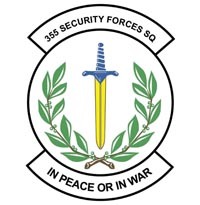 The 354th integrates with special operations in support of U.S. national objectives. Vision: Be the world’s best fixed-wing combat search and rescue, forward air control and a close-air support squadron. History: Activated Nov. 12, 1942, and ordered reassigned at the end of 1970 when the wing was inactivated only to join the 355th Tactical Fighter wing at D-M AFB, where it activated again in July 1971. 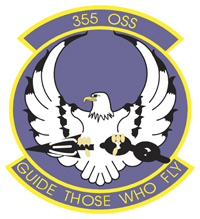 In May 1992, the squadron was under the 355th OG, then moved to McChord Air Force Base, Washington, on Jan. 5, 1993, but remained under the 355th OG. 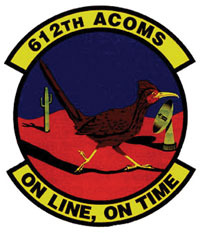 The squadron moved back to Davis-Monthan Oct. 1, 1994. Mission: Train pilots to plan, coordinate, execute and control day and night close-air support, battlefield surveillance, air interdiction, and reconnaissance in support of friendly ground forces. They also prepare pilots for combat mission-ready upgrade. Vision: Through disciplined and efficient instruction, build aggressive, quick thinking, combat-ready attack pilots with solid foundational mindsets and a technically accurate understanding of the A-10 and its tactical employment. Description: The 357th FS conducts all Air Combat Command formal course directed aircraft flying training, including transition, day and night tactics and weapons employment, day and night air refueling, dissimilar air combat maneuvers, and advanced targeting pod employment. The squadron prepares its students for and certifies them as combat mission ready attack pilots upon graduation. 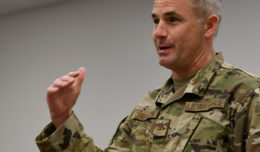 The unit is made up of roughly 20 military personnel, 24 A-10C Thunderbolt II aircraft, and associated squadron facilities and training equipment. Mission: Supports the 355th FW’s extensive flying hour program by performing on-and-off equipment maintenance operations for aerospace assets and control of all munitions. Utilizes manpower, funds, equipment, and supplies to ensure mission accomplishment, and prepares forces to deploy in support of all contingencies. Vision: Directs component repair, equipment maintenance, sortie production, and overall daily maintenance operations for 355th FW and associate units. The MXG supports eight flying squadrons comprised of approximately 80 A-10C, 15 EC-130H, seven HC-130J and nine HH-60G combat-ready aircraft with more than 1,750 highly trained and dedicated personnel while executing an annual operating budget of $72.2 million. Mission: The squadron maintains approximately 55 A-10 aircraft and generates all combat and training sorties in the 355th Fighter Wing by managing the efforts of Airmen in 13 specialties who maintain this close-air support, attack aircraft. 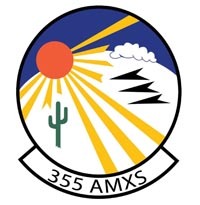 The 355th AMXS provides safe, properly configured aircraft in order to meet the flying-hour program for two fighter squadrons. The squadron also develops and executes scheduled maintenance plans to maintain long-term fleet health, while providing forces to support worldwide contingency taskings. Vision: Maintaining the fleet, training the Airmen, generating safe sorties at home and abroad, today and tomorrow. Description: The squadron consists of roughly 465 enlisted personnel, six officers, and two civilians. Mission: Provide timely and accurate maintenance and munitions support for Davis-Monthan’s assigned, tenant and transient aircraft and equipment. Vision: Take care of business, take care of each other, the rest will take care of itself. Description: There are more than 700 Airmen working in 19 maintenance, munitions, supply and administrative Air Force specialties, divided among five diverse flights: aerospace ground equipment flight, armament flight, fabrication flight, maintenance flight and munitions flight. They are dedicated to providing world-class maintenance and munitions support to Davis-Monthan’s 111 A-10, C-130 and HH-60 assigned aircraft, as well as all transient and tenant aircraft on base. 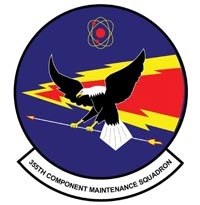 History: The squadron was constituted and activated as the 355th Consolidated Aircraft Maintenance Squadron on April 13, 1962, and redesignated the 355th EMS on Jan. 1, 1978. 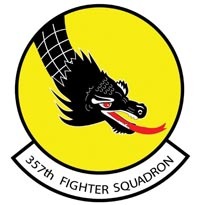 The squadron consolidated with the 355th Field Maintenance Squadron on Oct. 22, 1984. Mission: A combat-ready team of maintenance professionals providing world-class component repair and aircraft support. Vision: Be the best maintenance professionals in aircraft maintenance. 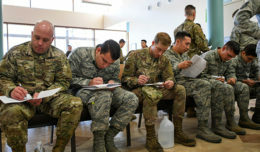 Description: There are approximately 301 active-duty and six civilian personnel encompassing aircraft electrical and environmental, aircrew egress, aircraft fuel systems, avionics electronic warfare, aerospace propulsion, test, measurement and diagnostic, and commander support staff specialties. The squadron troubleshoots, repairs and maintains A-10C, EC-130H, HC-130J, and HH-60G aircraft systems to include: electronic warfare equipment, TF34 and T56 engines, A-10 egress, fuel systems, and completes maintenance on aircraft accessory systems supporting seven flying squadrons comprised of more than 114 combat and training aircraft. In addition, the precision measurement equipment laboratory provides regional support for the calibration and repair of TMDE for 175 agencies including five forward operating locations and five MAJCOMs. 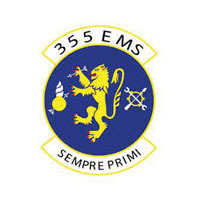 The 355th CMS provides combat-ready forces and equipment to combatant commanders worldwide. Mission: Removing obstacles that keep others from doing their mission; own the problem and provide a solution, and do it right the first time. Description: There are 1,700 military and civilian personnel in six diverse squadrons that train, equip and provide agile combat mission support, including civil engineering, communications, contracting, transportation, fuels, supply, deployment readiness, personnel, security forces and services for immediate worldwide deployment of combat support elements. The group also provides an effective in-garrison support infrastructure and quality-of-life services for 26 wing and 32 associate units spanning a 45,000 person, 10,530-acre community, one of the largest in Air Combat Command. Mission: Develop and deploy trained, resilient and capable combat-ready defenders worldwide. Execute superb integrated defense and mission-focused base support at home station 24/7/365 while taking care of our people, optimizing our resources and infrastructure. Vision: Mission-ready, resilient and air-minded security forces organized, trained and equipped to deliver enduring integrated defense against threats to Air Force, joint, and coalition missions; recognized and respected for our air-centric expertise. 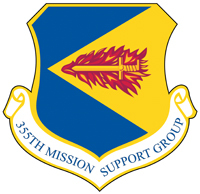 Description: The 355th SFS has diverse force protection missions in the Air Force. The Desert Defenders provide first-class force protection and security support for the 355th FW, multiple mission partners, and on-base federal agencies. Additionally, we provide police and military working dog services and combat arms weapons skills training. Our defenders deploy year-round to provide humanitarian relief, multinational training, and overseas air base defense operations in support of combatant commanders worldwide. The team consists of 310 military and civilian personnel. Mission: An integrated team of professionals planning, building, sustaining, and protecting the base and its environment for the Davis-Monthan community while providing combat-ready, deployable forces. Vision: Develop the Air Force’s most capable combat engineer team, while developing, building and sustaining the Davis-Monthan AFB community with a dedicated and mission-focused team of professionals. 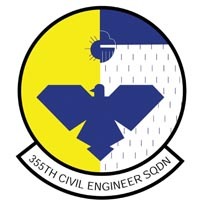 Description: Nearly 400 military and civilian engineers comprise the 355th CES. The squadron operates out of 21 facilities across the installation. Their efforts day-in and day-out provide the 355th FW and D-M teammates with a top-notch platform from which to train, operate and deploy. Vision: Deliver cutting-edge cyberspace capability, enabling decisive combat power and responsive humanitarian assistance.